Happy Thanksgiving weekend, everyone! I hope that you are enjoying your loved ones and not struggling with strangers at big box retailers. I hope to be doing the former but might be forced into a bit of the latter. Just a quick post from me today – I want to show you what’s in my wallet! I love my wallet. It’s tiny so it keeps me honest about what I’m using and what I’m not. 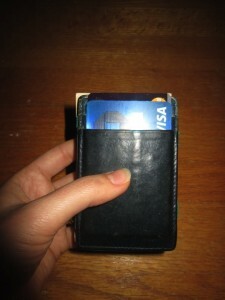 It’s a Jacob’s ladder wallet – it’s small and slim (can easily reside in my back pocket) and only has eight card slots. I’ve had it since about 2002 and despite all those years and a dip in the Pacific Ocean it still works fine! I try not to carry much cash – in fact, if I didn’t occasionally visit the farmer’s market, I wouldn’t want to have any at all! $11 is about right when I don’t have a farmer’s market trip planned in the immediate future. The receipts are the only component of my wallet that get kind of out of control. Twelve at one time is higher than I expected to find! I keep my receipts and Kyle’s in my wallet until I transfer them to our Receipts Basket, where they stay until we file them or throw them away. We don’t have a great system for receipts. I occasionally keep a pricebook for our food so the grocery receipts are good to have handy until I enter the data – but there’s no real excuse for the others! So that’s everything! I really need to get a better receipts system going – or just give myself permission not to keep them. Other than that I’m pretty happy with my wallet. Probably the next card to get bumped if we apply for another credit card would be Emily’s First credit card, which is only a backup one. How many items are in your wallet right now? How much cash do you like to keep on hand? Do you save receipts for any length of time? What should you take the time to purge from your wallet? 17 Responses to "What’s In My Wallet"
My wallet is in the bedroom and my wife’s still asleep, so I’ll just have to wing it. Money: Primary checking account debit card, $3 cash (I also don’t carry cash as a rule, this is what I still have leftover from the $10 I took out to pay from parking for last week’s brunch). That is smart to keep your access to money to just one source, especially a debit card. I have a few loyalty cards on my keychain too, but as you can see there is no space for them in my wallet! Receipts are the one thing that’s a bit out of control in my wallet as well. Besides that, it’s fine. I have my ID, 2-3 credit cards, my debit card, Costco card, Y membership card, a few pics & a little bit of cash. Not too much for you, either – good for you! I struggle to keep my cards down. I have all the loyalty program cards I don’t want to go without, airmiles, gas, groceries etc. Then on top of that I have 2 personal credit cards and 2 business credit cards. I think the biggest improvement for me would be to get my loyalty program cards onto my IPhone and lose them from my wallet. Thanks for sharing your wallet! Good point about the possibility of using your phone to access money instead of your cards. I don’t have a smartphone yet (just reserved one today!) so I don’t know much about that. I used to have trouble with keeping the receipts organized too! What do you keep permanently, though? I have lots of DATA and nothing to DO with it! 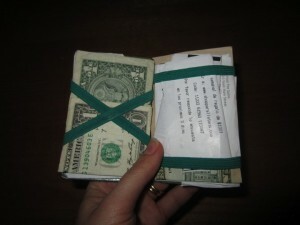 My wallet is an envelope system. I used to used Ramsey’s wallet (kind of large) and I have something smaller now. I would love to invent my own soon! No credit cards for me, so there is a small notepad, 3 blank checks, driver’s license, faculty ID, and anywhere between $5 and $200 (based on where in the month I am! Sounds like a very streamlined wallet! Do you have all the cash lumped together and use the notepad to differentiate the envelopes, or do you still physically separate it? I just looked in my wallet and counted, I have 9 items as well. Some of it I really don’t need to carry around with me. Like my Dental card and a Paradise Bakery card. I remember one time someone said I had a “George Costanza” wallet and ever since then I have kept it pretty trim. Yikes, that’s quite an insult! My husband had a bit of a George Costanza wallet going on a few years ago until I bought him a new one and helped him clean it out. I need to keep exactly 8 cards in mine or else they won’t stay in place, so I couldn’t downsize even if I wanted to while keeping the same wallet. Ah receipts! Those stack up so fast in my wallet too and once a week a receipt purging session is in order 🙂 Good thing the farmers market doesn’t give any receipts so don’t have to worry about it there. Unfortunately I do not get around to it once per week! It’s a good suggestion, though – maybe Saturdays will work for me.